Siliconies teething products are designed to be fun, functional, and stimulating. Our food-grade soft silicone provides a non-toxic chewy that is gentle on gums and emerging teeth. The textured surfaces provide excellent sensory stimulation and help to maintain interest. 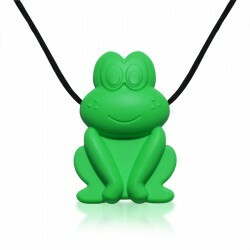 The Froggy Pendants have been designed with texture to maintain interest while nursing or playing and provide great sensory stimulation. They are also commonly used for children over age 3 as a fidget providing socially acceptable tactile stimulation. Each pendant hangs on a silky smooth black cord with a break-away clasp for added safety. The cord hangs 14" but can easily be shortened to meet individual needs. To shorten the cord, simply pull the cord through one end of the break-away clasp, knot at the desired length, and cut/discard remaining cord. Pendants are approx. 1.5" x 0.5" x 2.5"
Wash thoroughly before use. Products are easily cleaned with soap and water. Check products before each use and discard immediately when signs of wear or irregularities are noticed. Adult supervision is required at all times. Siliconies products have not been designed for aggressive, hard chewing by mature teeth. 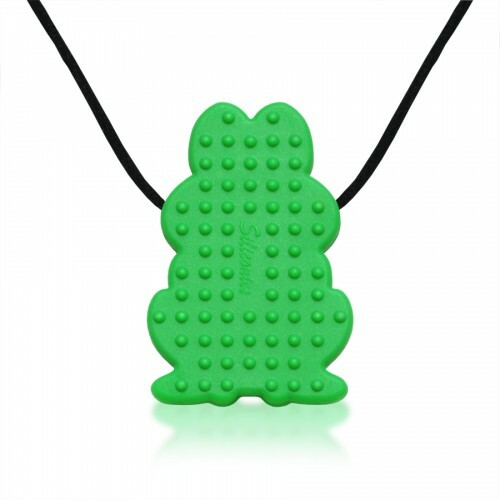 Teething necklaces are designed for parents to wear and should not be given to baby. Why Silicone? Silicone is an inert material that is durable and rubbery making it an ideal teething material for babies. Silicone is made up of silicon (natural element present in organic materials such as sand) together with oxygen. Silicone is also hygienic, hypoallergenic and resistant to bacteria. All Siliconies products are FREE from BPA, PVC, Phthalates, Cadmium, Latex and Lead. Our jewelry is tested by a CPSC approved lab and conforms to CPSIA standards as both children's jewelry and as a toy. Copyright © 2011-2012 Family Bedrock. All rights reserved.